Benjamin Netanyahu said as long as he remains Israel’s prime minister he won’t allow the creation of a Palestinian state. The words came a day before the parliamentary election, in which the polls predict victory to rivals of Netanyahu’s Likud party. In his interview with NRG news website, the prime minister was asked whether no Palestinian state would emerge if he remains Israel’s leader. “Indeed,” replied Netanyahu, who has led the Israeli government since March 2009. The answer contradicted his previous statements on the issue, as the PM backed the creation of a demilitarized Palestinian state as part of a permanent peace deal in his famous “Bar Ilan speech” shortly after being elected. Among Netanyahu’s main competitors in the Tuesday’s vote is the Zionist Union – led by Isaac Herzog and Tzipi Livni, who have initially agreed to run the government for two years each, should they win. However, the Zionist Union announced on Monday that Livni has agreed to give up on the power sharing deal to increase the party’s chances against Likud. According to Haaretz, she told Herzog that the rotation will not become a hurdle in the coalition talks and said that the most important thing is removing Netanyahu from office. They have criticized Netanyahu for Israel's cooling relations with the US and Europe. It comes after failed peace talks with the Palestinians and the PM's opposition to talks on resolving Iran's nuclear status. Netanyahu's Likud party is struggling for more seats in parliament, as the party is currently falling behind the Zionist Union. The PM switched from words to last-minute actions, offering the finance minister position to yet another rival, Kulanu party leader Moshe Kahlon. In an interview with Israel Radio, Netanyahu said he could work together with Kahlon to decrease real estate prices, just as Kahlon did with cellular prices when he was communications minister for Likud. He then admitted that he cannot form a government without Kahlon. Kahlon has dismissed the offer, saying “there was no doubt such spin would come” 48 hours before the elections. On Sunday, Netanyahu attended a rally in support of right-wing parties at Tel Aviv's Rabin Square, where he warned Israelis about the threat of a leftist victory. “There is a danger that a left-wing government will come into power, despite the fact that most of the public wants me as prime minister," Netanyahu said. But according to the law, a government can be formed only if a party gets more than 60 of the 120 total seats. However, no party has ever managed to gain such wide support alone. The final victory has always depended on a party's ability to find allies and form coalitions. Thus, Kahlon and his Kulanu party could be a deciding factor for Netanyahu and Likud. This scenario would be the fourth time that Netanyahu has formed the government. However, Kahlon has so far been silent about his preferences. It is expected that Kahlon’s own Kulanu party – which is focused on social and economic issues, ignoring politics and national security – will gain eight to 12 seats. However, Kahlon could shift the balance if he chooses to support one of Likud's main rivals. Recent polls predict the Zionist Union will get between 24-26 mandates in the future Knesset, while Netanyahu’s Likud should expect a somewhat fewer – 21-22 seats. This is when it would be up to Kahlon's party to decide who to support and lead to the top position – either Likud or the Zionist Union. 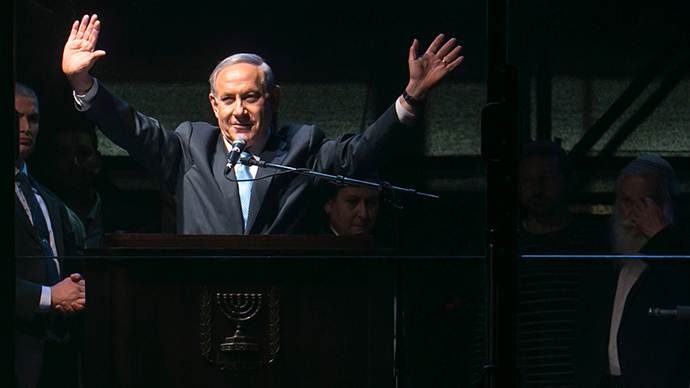 Netanyahu’s Likud could also be supported by several smaller parties. Political analysts predict he may be joined by the Jewish Home party, Yisrael Beiteinu, United Torah Judaism, and/or Shas. But even with support from all of those parties, analysts say Likud would gain 56 seats maximum. Meanwhile, the Zionist Union may agree to a coalition with United Arab List, Meretz and Yesh Atid – which, like Kulanu, is focused on social and economic support of the secular middle class. If she wins the election on March 17, Zionist Union's Tzipi Livni has pledged to re-build Israel’s relations with its Western allies, which have been ruined by what she describes as Netanyahu’s “hawkish” politics. “Netanyahu pushed the entire world away from Israel,” she told the media. At the same time, Netanyahu has accused “Western governments” of spending “tens of millions of dollars” to topple him and support his opposition. While Netanyahu still hopes to stay in power, recent polls revealed by the Jerusalem Post say 72 percent of those surveyed want changes. However, 12 percent have still not decided who to support. Netanyahu has been losing popularity recently, mostly due to his domestic policies, though external issues – such as the situation surrounding Iran's nuclear program – have also been blamed for his slipping approval rating. Last Saturday, tens of thousands of people rallied against the PM and his government in Tel Aviv, carrying banners reading 'Israel Wants Change’. Demonstrators called for a peace agreement with the Palestinians and expressed their dissatisfaction with Netanyahu's domestic policy. Organizers estimated the total number of protesters at 50,000 people, while police figures were more modest. The rally was not officially endorsed by any political party, but media reports said that most of the participants were from leftist and centrist parties. Israel's president gives an order to form a new government within a week after the elections, after the results are published. The responsible deputy has 42 days to do this. If he fails, the president replaces him, and that person will have 28 days to complete the task. If a third candidate is appointed, he or she will have an even shorter deadline of two weeks. If all attempts to form a government fail, the country will hold new elections.